What do you do you call someone who RSVPs yes to the destination wedding of the century? What do you call someone who blatantly ignores advice from all quarters about going to Italy with this crazy family for this crazy family trip? What do you call someone who manages to put up with every outburst from every person in our party in every foreign country? What do you call someone who manages - with aplomb, no less - to keep her cool while the rest of the family melted down around her? What do you call someone who Freudianslips herself on to the train to Geneva, rather than catching the right train with the rest of our party? What do you call someone who - despite 10 days hanging out in very close quarters with my nutty family - is still talking to me and other members of that family? Happy (insert years of choice here) birthday, Erika! I may not be able to make you a trending topic today, but it's not for lack of trying! Huh. I forgot to talk about the magnet! 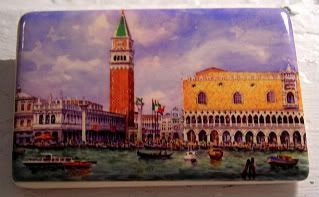 I bought this one in Venice - before all the rains began last December. Actually, I think I'm supposed to have given this one to Erika, but let's not tell her. I picked it for two reasons. First, because of the purple skies. If you've ever seen anyone who likes purple, they don't, not when compared to this chick. And second, because she managed to get through one rather miserable evening in Venice with sadly, the crappiest food in the world, without jumping into the canals. 1- Thanks for the birthday post! 3- Is this another jab at my age, your using the Golden Girls theme as your headline? !